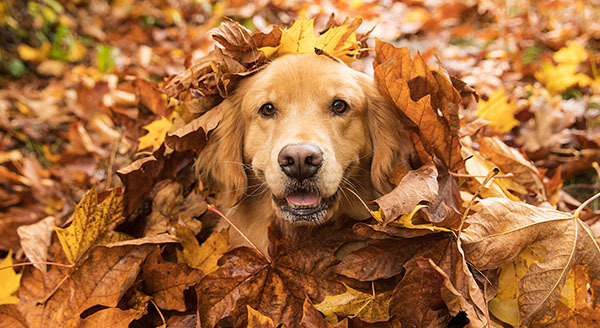 The hot, muggy dog days of late summer are upon us here in the Chicago area, but at Hendricksen Tree Care, we are excited about the upcoming fall season. Autumn is such an amazing season in the city of Chicago and its suburbs because of the brilliant fall foliage and scenery around the area as well as the more moderate weather. The fall leaves look beautiful anywhere you go in the region whether you see brilliant reds and yellows dotting the urban landscape or a sea of autumn leaves at one of the many Chicago area parks and forest preserves. We are just hitting September which means that the fall season is close and the leaves will soon start to change colors. Autumn in the Midwest gives us one last chance to take in the natural beauty of the area before the winter inevitably sets in. 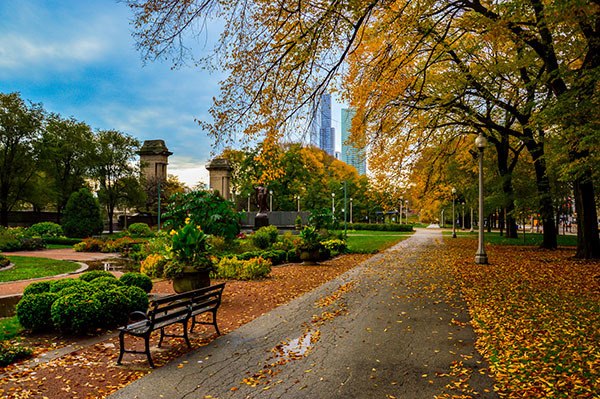 There are so many trees in Chicago that put on a show with their fall colors and there are also many great areas both within the city and in the suburbs to view the stunning fall scenery. Even the trees in your own backyard will soon be showing their fall colors. 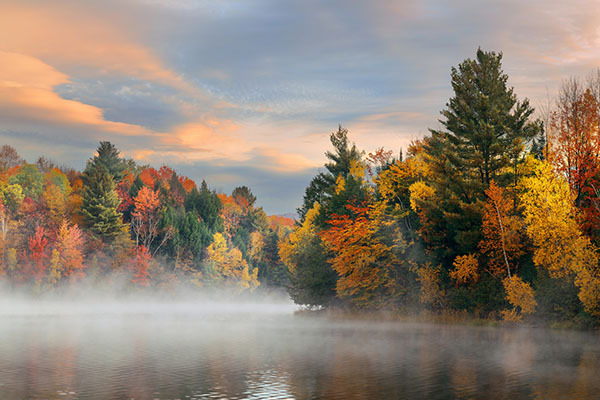 In this article, we will highlight some of the trees to look out for this fall when their colors change, as well as some of the best places in and around Chicago to view the fall foliage. 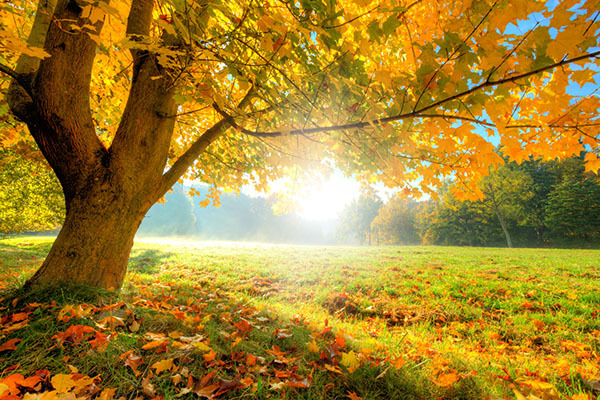 Before we get too far into the fall, it is wise for homeowners to take care of the trees on their property and provide the last bit of fall maintenance that they need to survive the winter. 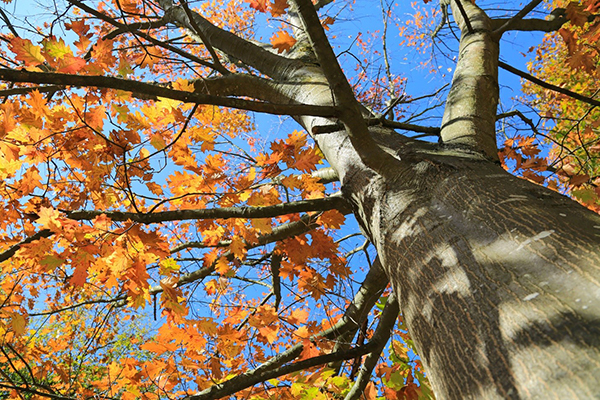 Many types of trees benefit from late fall tree pruning and fertilization. If you would like professional assistance to ensure that your trees get the proper fall maintenance, call our professional arborists of Hendricksen Tree Care. Dogwood trees are flowering trees that look vibrant right from the beginning of the growing season when their showy white, purple, or pink flowers bloom. In the fall, the leaves of a dogwood start to turn orange and eventually turn a dark, vibrant shade of red. The red color of the dogwood leaves in the fall causes these trees to really standout, even when amongst other trees displaying their fall colors. The mighty oak is one of the biggest native trees in the Chicago area and their large canopies look very impressive when in their fall colors. Oak leaves change from yellowish orange to deeper shades of orange and even red. 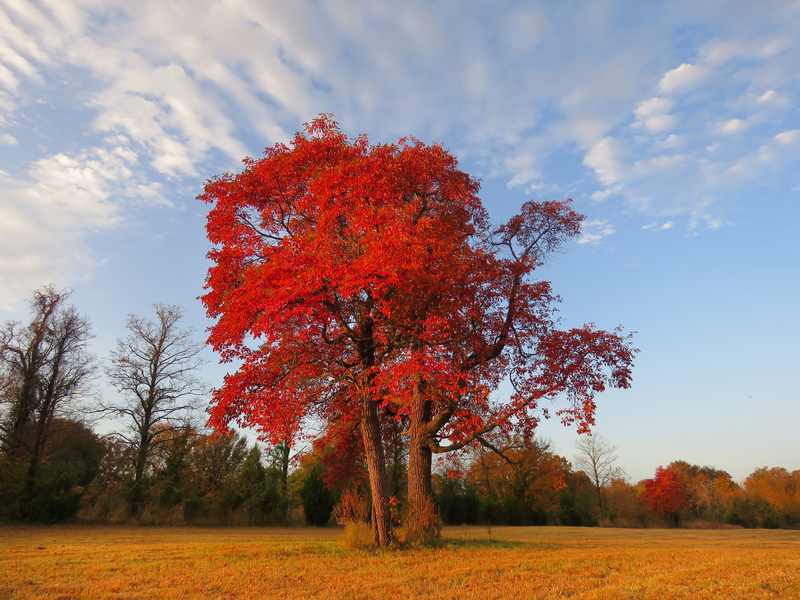 It is not uncommon for one oak tree to be displaying several colors at once in the fall. Oak leaves are quite large and a favorite for kids who like to jump in leaf piles after raking. Like oak trees, ash trees are large trees with expansive canopies that look impressive in the fall. 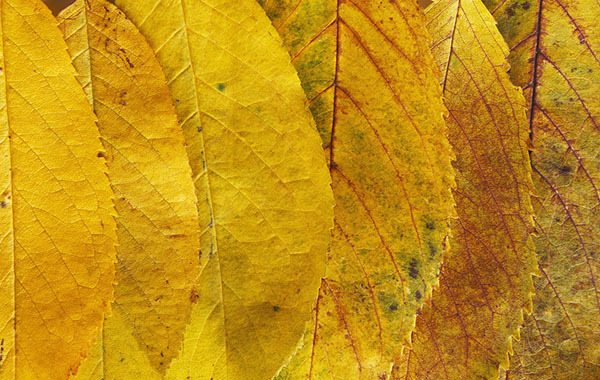 Ash tree leaves may turn a range of different colors in the fall from yellowish green to purplish red. Its large thick canopy really makes these trees stand out in the fall. Sassafras trees are fragrant, flowering trees that look stunning throughout much of the year. In the fall these ornamental trees do not disappoint as their leaves take on red and orange hues. It is common for the leaves of sassafras trees to be several different colors simultaneously in the fall. Crabapple trees are very colorful year-round because of their showy fruits and flowers that can be a whole range of different colors. 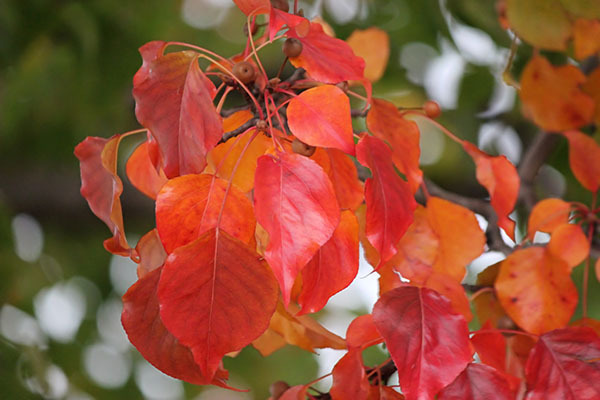 The leaves of crabapple trees tend to turn vibrant shades of orange and deep red, almost purple, in the fall. Eastern redbuds are another very colorful tree that looks just as vibrant in the fall as it does in the rest of the seasons. These trees have purplish-pink flowers in the spring and their leaves can turn shades of yellow, orange, and red. Maple trees are all over the Chicago area and they have great fall colors that are enhanced by their large leaves and canopies. The leaves of a maple may exhibit a range of different colors from yellowish green to orange to red. The round, brightly colored canopies of the maple make it one of the fall favorites in the area. Gingko trees are another interesting fall species of note as the fan-shaped leaves turn a very bright yellow. 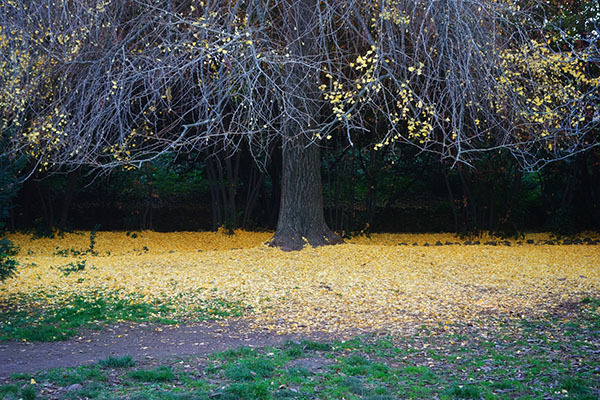 If left undisturbed, the leaf pile on the ground can make a very striking display around the tree’s base. Feel free to use the golden yellow Gingko leaf in your autumn decorations or even as a bookmark! Chicago Botanic Garden sits on over 300 acres and it contains 26 gardens. You can walk around the gardens yourself to take in the fall foliage or walk along their recommended fall foliage walk to see the best of what the Chicago Botanic Garden has to offer. The Maple Grove Forest Preserve is a great place to see maple trees in their fall colors. Guests can walk the trails of one of DuPage County’s oldest forest preserves and take in the many colorful fall hues of the maple trees. The Morton Arboretum is a large arboretum in the western suburbs that sits on 1,700 acres and has over 4,000 different species of trees. Their Midwest collection includes favorites of the area including maples, dogwoods, and oaks in their vibrant fall colors. Visitors can also see the fall colors of non-native trees in their other collections including their China Collection. This nature museum is located in Lincoln Park in Chicago and is surrounded by native trees and shrubs growing within the park. There is a Native Gardening exhibit which includes trees and shrubs native to the Chicago area that you can check out any time of year. Nestled in Millennium Park in downtown Chicago is Lurie Garden which sits on 5 acres of land. There are several gardens within this area that contain native trees and shrubs with brilliant fall colors. The scenery at Lurie Park is further enhanced by the Chicago skyline which is a close distance away. Garfield Park Conservatory is one of the largest of its kind in the world. The conservatory itself contains over 600 species of various plants, including trees and shrubs, and there are also plenty of trees on the surrounding property that make for impressive fall scenery. This garden is located south of the main entrance for the Art Institute of Chicago and it provides a great oasis in the heart of downtown Chicago. The south garden contains a reflecting pool that is surrounded by native cockspur hawthorn trees that turn vibrant shades of red and orange. 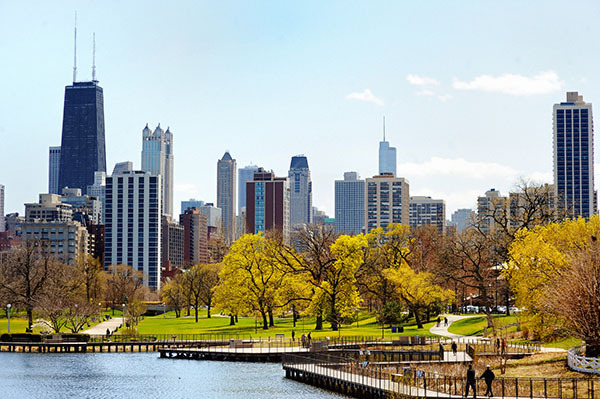 The parks and forest preserves highlighted here are just some of the areas within Chicago and its suburbs where you can take in the impressive fall foliage. Check for parks and forest preserves in your town where you can take a walk and admire the autumn leaves. No matter where you go in the area, you are bound to see Chicago trees at their most colorful. 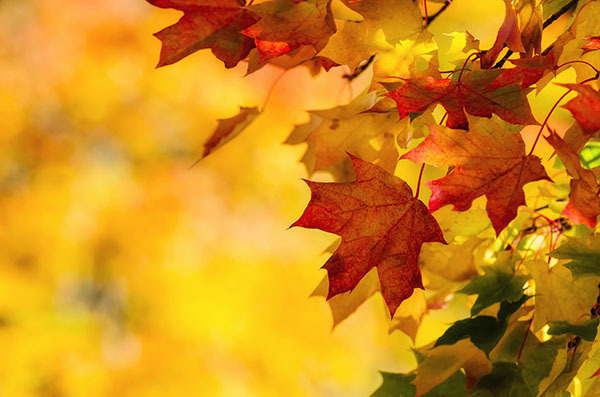 When admiring the beauty of fall foliage, it is easy to forget that your trees need maintenance to get them prepared to survive the Chicago winter. Trees often need to be pruned during the fall to remove dead and damaged branches before the winter and they need to be fertilized to ensure that they have the nutrients necessary to make it through the harsh winter conditions. At Hendricksen Tree Care, we provide complete tree care services in Chicago and the north and northwest Chicago suburbs to keep trees healthy and well-maintained. Our ISA certified arborists can handle a range of tree care services including tree trimming, fertilization, treatments for insects and disease, and tree removal when necessary. We admire the beauty of fall foliage in the Chicago area just like everyone else and we make it our goal to keep Chicago’s trees healthy so we can enjoy the beauty of fall leaves each year.